That’s okay, Barry. It’s still good to have you and the rest of the Central City gang back after a prolonged winter absence, particularly with an episode that hits the ground running the way “Revenge Of The Rogues” does. Barry’s concern over his speed dates back to the appearance of the Reverse-Flash, a looming threat Dr. Wells is all too willing to exploit in order to build up Barry’s powers. The episode opens with a training exercise as the Flash dodges missiles from a Cisco-controlled drone (does he have a permit for that thing?) and, in what may be the week’s coolest effect, snatches one of midair and flings it in the opposite direction. 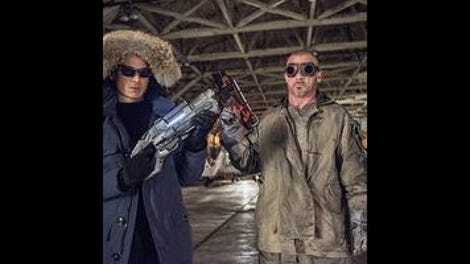 Crime in Central City isn’t going to take a holiday just because the Flash is in training mode, which brings us to the rogues of the title: Leonard Snart/Captain Cold (Wentworth Miller) and Mick Rory/Heat Wave (Dominic Purcell). This is the Prison Break reunion fans of that show have been waiting for, and while I can’t really speak to the pairing’s effectiveness on those terms (having only seen a handful of Prison Break episodes years ago), they make a fun duo here. 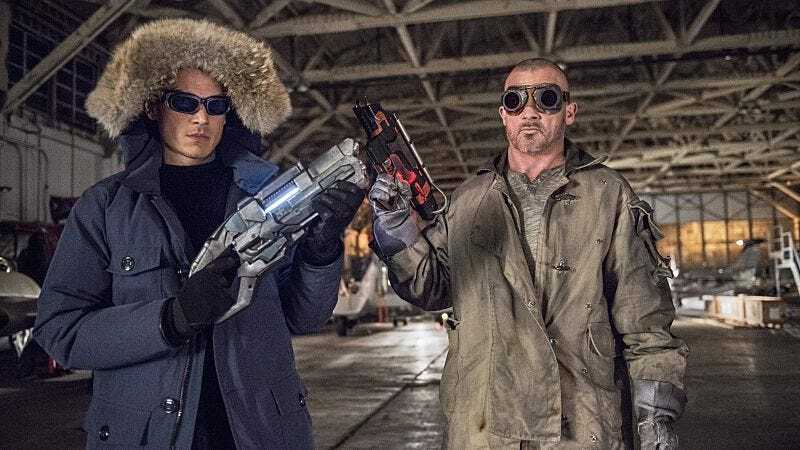 To an extent, the characterizations are obvious: Rory is the hothead (Joe even says so toward the end of an episode that was a little pun-heavy, if nowhere near Batman & Robin territory) and Snart is cool, calm, and collected. But the performances are irresistable: Miller savors every line of dialogue like it’s his last, contrasting nicely with Purcell’s uncontained energy. The moment when Heat Wave burns up the $25 million painting is the giddiest I expect to feel over the destruction of art this year. The final showdown, with Barry trying to get Snart and Rory to cross the streams Ghostbusters-style (with an assist from Eddie, apparently over his hard feelings), is a well-staged blast. But that’s not all! The episode also manages to weave in Caitlin’s continuing search for Ronnie, as FIRESTORM turns out to be an acronym for a transmutation research project conducted by a student named Jason Rusch and a missing scientist named Dr. Martin Stein. (Fans of DC Comics know how Stein ties into the Firestorm story, but for now let’s just say he probably won’t be missing for long.) Cisco gets his moment in the sun by demonstrating a super-defrosting shield for the CCPD to use in battle against Captain Cold. On the domestic front, Barry and Iris are still distant, especially given that Iris is set to move in with Eddie. On another show (oh, let’s just say Gotham), all of this activity might play as too sprawling and disjointed, but the Flash brain trust has done such a good job of building the world of the show, it all feels part of a greater whole. Even if the Reverse-Flash doesn’t appear onscreen (not in costume, anyway), his presence is felt throughout the episode. Barry is gaining confidence as he’s gaining power, but he still has two mentors: Dr. Wells and Joe. As with Snart and Rory, the dichotomy is self-evident; Wells is the brains and Joe is the heart. Wells is focused on the big picture (going all the way back to the pilot and the “Flash Disappears In Crisis” headline of the future), while Joe urges Barry to follow through on his instincts to protect his loved ones and his city from evildoers. Joe is on to Wells to some degree; he certainly doesn’t grasp the full range of the good doctor’s manipulations, but he has a pretty good idea Wells is trying to pull the strings. It should be fun to see how this cat-and-mouse game develops. Everything else should be fun, too, based on how the season has gone so far. The good news is the show has already been renewed for a second season. Watching this episode, I was a little surprised to realize how much I’d missed The Flash. It’s a relief to know there’s still plenty more ahead. Escaping from the Iron Heights transport sort of counts as a prison break, right? Speaking of which, Leonard Snart’s sister looks to be the newest member of the Rogues. I can’t say I’m familiar with the exploits of Golden Glider, but the DC Comic Wiki helpfully notes that she has “technologically advanced figure skates.” Sounds formidable. Jesse L. Martin Eye Moistness Level: Critical, during the “Iris moving out” scenes. Fortunately he’s got a new roommate in the Flash, which should definitely come in handy when it’s time to do the dishes. The Pied Piper is due next week. More importantly, if IMDb is to be believed, we’ll be seeing Grodd very soon.